If you have several pictures you'd like to display together within a single frame, think about creating your your own collage mat specifically for your collection. It's easy, affordable, and best of all, it's CUSTOM! Here are the steps. 1) Choose your mat board by price, color or archival quality. The outside dimension of of the board is limited to 30 x 38 but within that, we can cut your openings in the arrangement you design. The smallest size opening we can make is 1” x 1” and we do like at least 1” between each opening and around the outside borders. 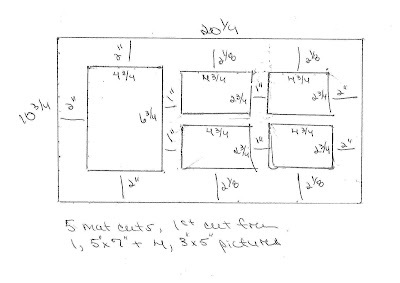 2) Now, decide on the layout, or arrangement of your collage and the size of the openings you’d like to see. Get creative! This is a custom mat! Use any combination of shapes: rectangles, circles, ovals & squares and sketch it out on paper. 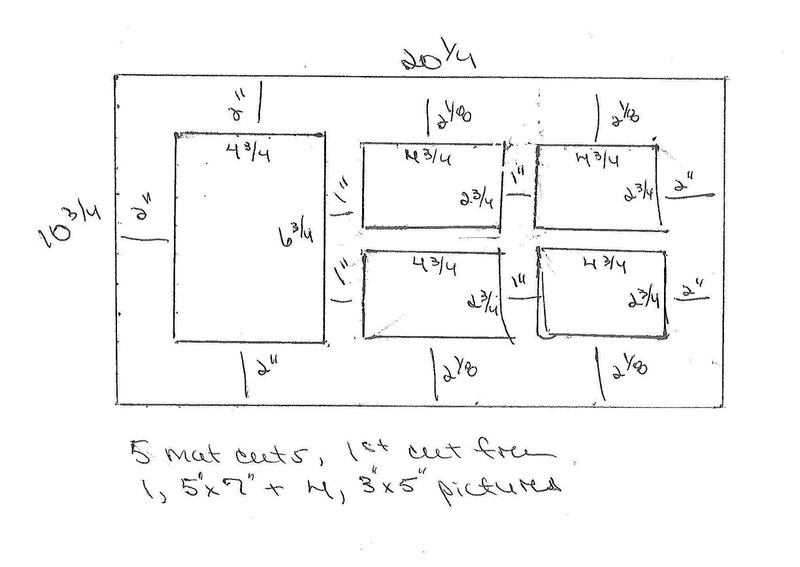 3) Once you’ve determined the layout, mark the sizes of each opening and the space you want between them as well as mat board borders. Remember to allow for an overlap so your picture stays within the mat board window. A 1/8" overlap is usually sufficient and can be easily figured by subtracting 1/4"from the width and the height of each opening. As you can see, the sketch doesn't have to be anything fancy. 5) If you want a double mat please submit a separate drawing with the openings and dimensions to accompany the first design. Often a top mat will contain more openings than the bottom to allow for floating of an image or an object, such as an engraved plate or pin, within a specific mat opening. 6) Figuring your price is easy. It’s the mat board price plus $3.00 per extra opening. The first opening is free. For example, an $8.00 board with 5 openings would be priced at $20.00, plus whatever other framing materials you purchase. How’s that for value? 7) Place your order in the way that’s most comfortable for you. 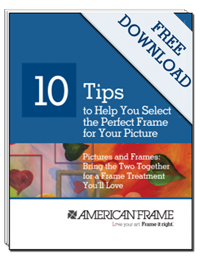 If you order your materials online, please alert us in “special instructions” at checkout that a drawing will be sent to us, then simply email your design to procut@americanframe.com or fax it to (800)893-3898 marked with your online order number so the two can be properly matched. If you prefer the phone please call us at 800-537-0944 M-F but still send us your drawing either by fax or email with your contact information attached. 8) Enjoy the uniqueness of the custom treatment you just created! Very informative on how to draw up a diagram.